4 What Does This Mean For Android? If you're a dedicated follower of tech news, you've probably heard the big story from late last night: Microsoft is buying Nokia. Holy cow, Redmond has an end-to-end distribution model! This could finally make Windows Phone a competitor! The phone and tablet market is getting its first major shakeup since the rise of Android! Well, yes, and then again no. While it's true that the upcoming acquisition is a huge deal for Microsoft, and an even bigger deal for Nokia and anyone who's invested in the company (either in a monetary sense or as a customer), I can't see it having a huge impact on Android. In fact, I don't think it will have an impact on the phone market at all. Let's back things up a bit. Dateline: February 2011. Stephen Elop, the new American CEO of Nokia and Microsoft's former head of the business division, announces that Nokia is forming a strategic partnership with Microsoft to build smartphones. While Nokia had some of the best and most powerful hardware in the pre-iPhone days, and it was technically the largest phone manufacturer in the world in 2011, its Symbian operating system had not aged well in the new era of smartphones. The company was in danger of becoming the biggest supplier to a dying, low-margin market - "dumb" phones. Under Elop, Symbian would be"franchised" (read: licensed to various partners for low-powered smartphones) and Nokia would focus almost exclusively on creating devices running Windows Phone 7 (later Windows Phone 8). While the initial partnership announcement makes an almost pitying mention of Nokia's next-generation OS MeeGo, only one MeeGo device is ever created, and development on what was once seen as Nokia's answer to Android and iOS sputters and dies. In Nokia's home country of Finland, the reaction to Elop's partnership with Microsoft is almost universally negative. The Finns have always had a huge amount of pride in Nokia, and the move is seen as a way in which the company is becoming dependent upon an outside company for the first time... an American one at that. The smartphone market is shifting towards iOS and Android, both from American companies. More than 1,000 workers at Nokia's Tampere headquarters walk out of the office in a peaceful but frustrated protest of the decision. At the time, Elop's move is seen as something of a gamble. He had been a major executive at Microsoft less than six months before (where he oversaw the Office line, one of Microsoft's most crucial profit centers on the software side). Before the announcement of the deal with Microsoft, Elop put his decision in context with the now-famous Burning Platform memo, a message to Nokia's employees summarizing the company's position and likening the dominance of Android and iOS as a burning oil rig. ...I have learned that we are standing on a burning platform. And, we have more than one explosion – we have multiple points of scorching heat that are fuelling a blazing fire around us. While the move to Windows Phone is certainly colored by Elop's relationship with Microsoft, Android hasn't yet become the 800-pound gorilla of the smartphone world, and though Apple is already making stratospheric amounts of money, it doesn't seem like the unbeatable behemoth it will become later. Nokia is still the biggest phone company in the world. At this point they still sell more smartphones (running Symbian) than anyone else. Plenty of Nokia commenters both in Finland and elsewhere think that the company might have been better off with Android, but surely their manufacturing and market position can drive Windows Phone to compete with the big boys. Right? It took Nokia the better part of a year to completely switch over to Windows Phone. By the second quarter of 2012, Nokia had shipped less than 10 million Windows Phone devices worldwide, and less than a million in North America. Compare that to 30 million Symbian smartphones sold in the fourth quarter of 2010, and then compare it to about 25 million and 100 million iPhones and Android phones sold in Q2 2012, and it had become clear than Nokia's burning platform had started to tumble. Despite well-received hardware and design, monetary support from Microsoft, and some camera technology that's still truly unmatched, Nokia's Lumia line has failed to catch on. European carriers told reporters as early as April 2012 that Nokia Windows phones just weren't good enough to compete with Android and iOS. As Windows Phone's market share stalled (or plummeted, if you compared it to Windows Mobile's formerly competitive position), Nokia's stock price continued to take a dive. From a market cap of more than 200 billion dollars in the beginning of the 2000s, to 150 billion in 2007, Nokia's market cap is just shy of $15 billion today, with shares trading at under $4. It's impossible to see the last decade as anything but a monumental failure on Nokia's part, at least in purely economic terms. And the partnership with Microsoft would seem to be the final nail in the coffin. Nokia's fall is inexorably linked to the rise of Apple, Android, and Samsung. The company could have gone Android at any point - in fact, fans of both Nokia and Android have been clamoring for exactly that for years. Nokia's hardware designs are some of the most highly-regarded in the world, and they've only gotten better with the Lumia line. Both of Microsoft's other licensees for Windows Phone, Samsung and HTC, were also making Android phones. What gives? It would appear that the decision to ignore Android as a potential OS was purely in the hands of Stephen Elop. As late as July 2013, Elop was quoted saying that he was "very happy with the decision we made," citing Samsung's dominance of Android as justification. Elop more or less stated that he saw this coming, and wasn't interested in playing second fiddle to the South Korean company (see: HTC, Motorola, and pretty much every company that isn't Apple). It's worked, sort of: Nokia is pretty much the only company that's creating Windows Phones that anyone cares about. But that just means that Nokia is adrift in a lifeboat with no company. 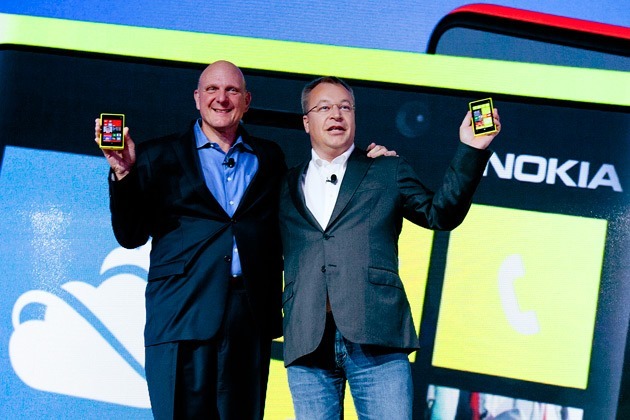 Instead of playing second fiddle to Samsung, Elop played a solo while Nokia burned. Considering Elop's history with Microsoft, Nokia's plummeting fortunes, and Microsoft's desperate need for a mobile platform, it's hard not to read between the lines of this acquisition. Rumors of Microsoft buying Nokia were floating as early as January 2012, and reports that Redmond had passed on the deal were circulating that summer. Why not wait to buy the failing hardware business and pick up a former giant for a 7.2 billion-dollar song? In the coming months, there will be hundreds of thousands of words written speculating as to the mindset of Stephen Elop. Why did he leave Microsoft? Why did he join Nokia? Why did he dedicate the company to an unproven OS? Why did he sell? And why did he sell right after Microsoft's CEO Steve Ballmer stepped down? I'm not going to suggest collusion here, because frankly, Nokia's shareholders and fans are going to do that for me. Some of them are probably going to do it in court. Less than 24 hours after Microsoft made its intentions clear, Ballmer told the Seattle Times that Stephen Elop would be leaving the CEO position at Nokia to become an Executive Vice President at Microsoft. He'll be heading a new hardware division overseeing not just Nokia, but the Windows Phone platform, Xbox, and the Surface tablet line. For a CEO who stood on a burning platform and couldn't put the fire out, it's an amazing shift in fortune. He's already being cited as a front runner for the now-vacant Microsoft CEO spot. By the way, you should definitely check out Android Police alumnus Eric Ravenscraft's entirely fictional account of this little corporate drama. It's fantastic. What Does This Mean For Android? So, what does all this mean for you, the dedicated Android user? Nothing. Absolutely nothing. Nokia, and by extension Windows Phone, was failing to make headway in the smartphone business before Microsoft decided to buy it. The company was already the largest supplier of Windows Mobile devices. What exactly can Microsoft do to help? They'll certainly be infusing the business with cash and using their considerable muscle to push more devices and more marketing. 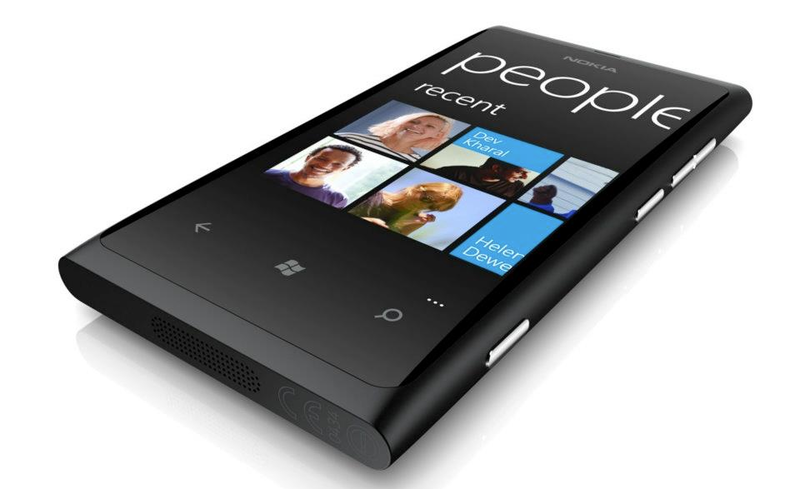 They'll probably expand Windows Phone 8 to more territories and more carriers. You can bet your sweet bippy that the Xbox One will integrate with Nokia hardware within the next year. So what? Despite nearly doubling the number of shipped phones from last year, Windows Phone has gained less than 1% in market share. 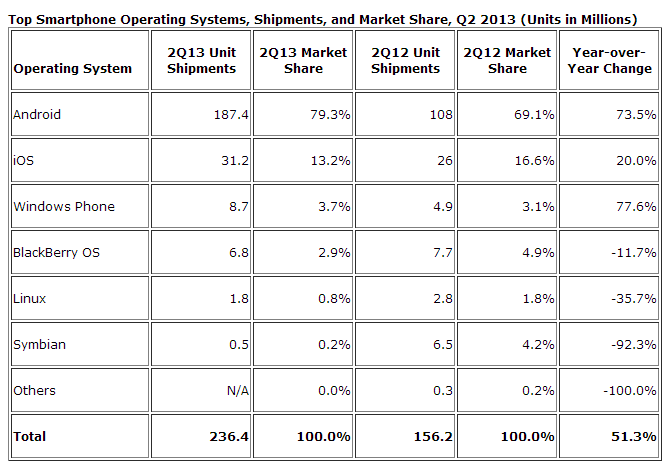 Meanwhile Android shipped 187 million devices in the second quarter of this year alone, capturing just shy of 80%. As it stands now, there's just nothing that Nokia or Microsoft can do to crack the duality of the current market. I've used Windows Phone devices. They're nice. The software is improving, and so is the app selection. But there's just no way that a closed ecosystem on a limited number of devices can hope to compete. Microsoft should know that - after all, it's more or less how they beat Apple in the desktop market decades ago. Now they're on the other side of the fence and trying the tactics that they've already proven don't work. I'm no Nostradamus. Ten years ago no one thought that Blackberry or Palm would be ground beneath the heels of a niche desktop maker and a search engine company. But Microsoft and Nokia as they are now pose no threat to Android, and no real reason for an Android user to switch. Now there are three end-to-end mobile companies (including Apple and Google-Motorola) and Microsoft is undeniably the weakest. I can't help but be reminded of the last time a struggling phone company got snatched up by a PC giant: HP's disastrous acquisition of Palm. It does mean that we can finally stop pining for Nokia hardware running Android. Hooray.